The new Teaching Online: Professional Development Library, intended to serve as a growing resource, addresses online challenges and provides extended learning opportunities for online instructors with varying schedules. The recorded sessions, presented in DVD format, are now available for faculty checkout at the Circulation Desk of Magale Library. Roughly 60 percent of college instruction is adjunct-led, but many colleges fall short in providing adequate resources and training for their adjunct professors. As we depend more and more on adjunct professors, it is essential that colleges look for ways to improve adjunct recruitment, retention, and development. Session one of this webcast will cover moving an adjunct through the whole sequence from hiring and training to evaluating and retaining. In the second session, we’ll cover in more detail how you can develop an online environment that provides scalable and efficient methods for supporting adjunct faculty. Powerful influences, such as Twitter, Facebook, U Tube, and Teacher Tube, can be effectively incorporated into the educational environment, engaging students with recognizable formats and functions. How to Orient New Instructors to an Online Course FAST! The dynamics of today’s online classroom require careful planning to build an instructor’s confidence and familiarity with course content and delivery technology. Jennifer Berghage, Instructional Designer at Penn State’s World Campus, presents tools and techniques that can be used to ease an instructor’s transition and protect the quality of the learning experience for their students, beginning with the first day. Learn how to design assessment strategies aligned with a learner-centered instructional framework that considers both content and the skills used in learning. Session 1 – Develop effective forms of online assessment that are relevant and accurately measure learning. Construct successful assessment strategies and frameworks that are specifically designed for online learning environments. Ensure that assessments are aligned with course objectives, activities, and assignments. Implement technology to support various assessment options. Session 2 – Learn how to design and develop assessment building blocks and assessment strategies for online instructional environments, including the selection of appropriate assessments from sources such as: peers, students, rubrics, collaboration groups, and self. Larry C. Ragan, Ph.D. presents the 12 key benchmarks for online instruction, as well as carefully developed online course guidelines and best practices to help instructors avoid the trap of “just winging it.” This seminar gives methods to strengthen an instructor’s course performance record, increase student satisfaction and retention, and enhance the institution’s reputation. Finding tools for evaluating online faculty, especially new hires, is critical to building and maintaining a high quality online program. What steps should be taken to ensure that a new instructor’s experience, competence, and teaching philosophy will meet the standards of your institution? How do context, instrument, process, and validation strategy serve as useful rating criteria? Thomas B Cavanagh, Ph.D., welcomes you to consider adapting and customizing the evaluation model used by the University of Central Florida, the second-largest public institution in the U. S. with over 56,000 students. Let us get you information tailored to the academic programs you're interested in. 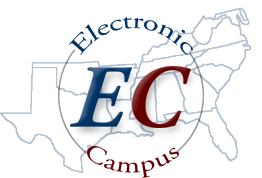 Southern Arkansas University is a member of Electronic Campus, your comprehensive source for information about higher education opportunities and services across the South.